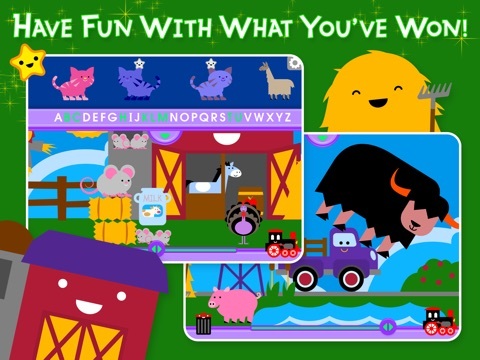 School Zone’s Clickity-Clack Alphabet offers an entire world full of entertaining practice with the ABCs. Youngsters will love the illustrations, sound effects, animations and most of all, the make-your-own farm scene. 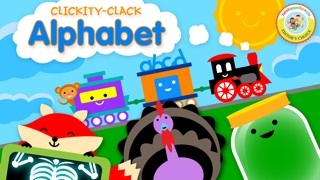 Clickity-Clack Alphabet is a comprehensive letter practice app that will captivate most young children. With tracing activities, letter matching, letter sounds, missing letters and lots of key word repetition, this app really covers the bases. 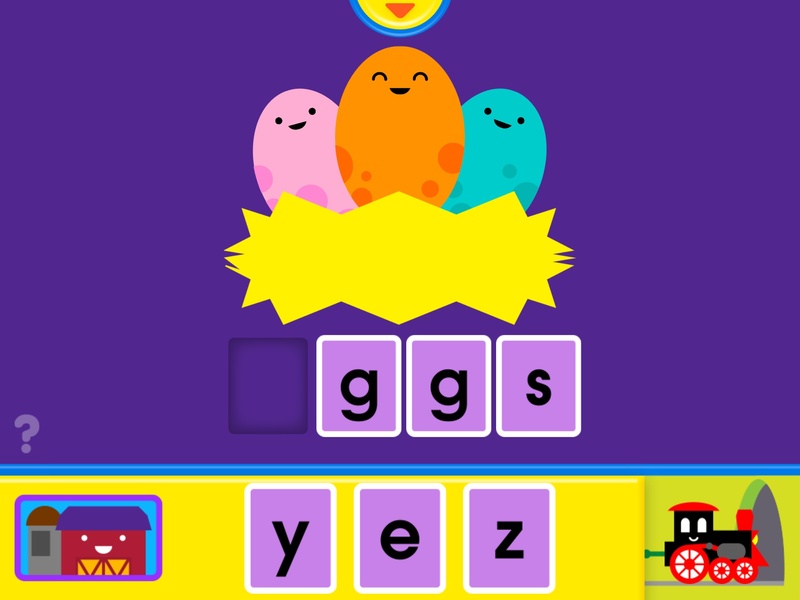 Clickity-Clack Alphabet is a high quality app. The games are quick and easy to learn, and the developers have included contextual help systems that use both visual demonstration and auditory directions to clarify the interactions needed. There is a high degree of control over the details of the game, accessible by clicking the rotating gear in the upper right corner of the screen. From this section, users can change the volume on the background music, choose capital or lower case letters, or even reset the app. The artwork is clear, crisp and colorful, and the animations and narration are outstanding. School Zone’s Clickity-Clack Alphabet offers a very comprehensive system for beginning alphabet practice. The app encourages the kind of free play and exploration that is perfect for preschool learners, and does a good job of balancing work on the various skills covered. There are several different activities, including a tracing exercise, finding the picture that begins with the target letter and filling in missing letters on simple words. Each reinforces the letter’s sound, appearance and key word. In addition, users can choose a letter from a display of all the letters in order, which will help many to get an idea of alphabetical order. And developers included a great feature: the ability to set the app to show capital or lower case letters. 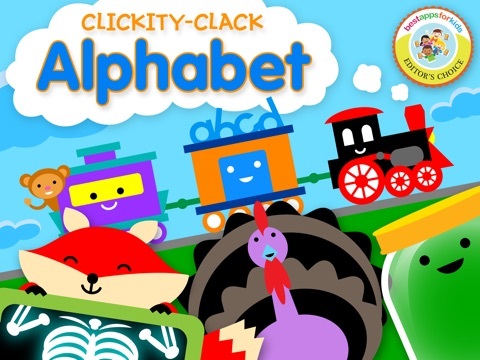 The makers of Clickity-Clack Alphabet have a good grasp of what preschoolers will find fun and entertaining. Correct responses to each activity are rewarded by short, fun animations of brightly-colored characters. Completion of each activity also adds characters to an animated farm scene. The scene contains hidden animations to discover, and users can add the characters earned from their work with the activities and move them around. 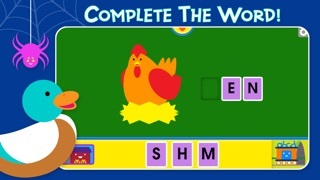 For example, completing an activity for the letter G makes a goat available to add to the scene. When children drag the goat onto the farm, he frisks across the screen, finally exiting to the right and jumping in from the left in an endless loop. Add a few characters, and the scene will be abuzz with movement and sound! This app has a lot of value for young children. It’s fun and has a lot of replay potential. 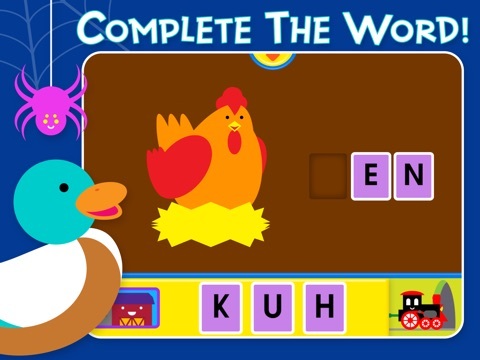 It also utilizes many sound teaching strategies to help users learn about letters, beginning sounds, key words, and more. There are at least three activities for each of the twenty-six letters, so purchasers get over 78 different exercises that can be used again and again. Furthermore, the settings section contains an option to completely reset the entire app to the beginning, which will help motivate young users to complete the activities again and again. Clickity-Clack Alphabet is very child-friendly. The app contains no outside advertisements or in-app purchases. There is a well-protected parents’ area that contains links to social media, newsletter sign-up form, links to other apps from the developer in the App Store, and a live link to the company’s website. However, there is little chance of a young child accidentally accessing this area, so these resources are available only to older users. Developers may want to consider adding information about how to help young children develop alphabet skills, such as off-line suggestions for phonemic awareness activities and so forth.